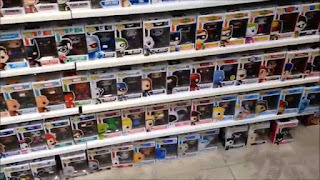 The Newest Rant: Funko Friday: What Are Funko Pops and How Do You Start Collecting Them? Funko Friday: What Are Funko Pops and How Do You Start Collecting Them? On Fridays I will sometimes do my, "Flashback Friday," posts and other times I will do my, "Film Friday," articles, with those two themes intersecting off-and-on as well. In the past months I have gotten more and more into Funko Pops however and thought it might be fun to have another occasional segment, "Funko Friday," where I discuss various subjects relating to Funko Pops. With that in mind, for the debut segment I wanted to help explain to people just what Funko Pops are and how you can start buying and collecting them. A Funko Pop is a figurine that generally has a little body and big head. 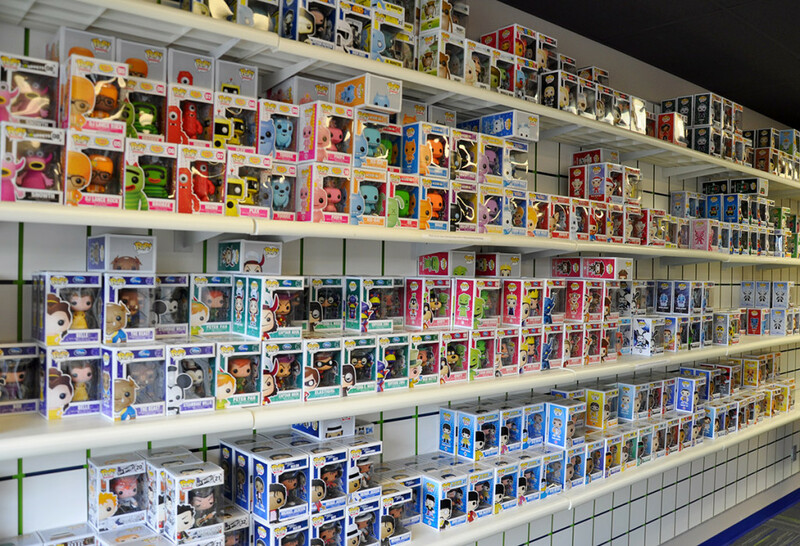 There are a variety of figures that are within the Funko company and go by different names (Dorbz, VYNL), but the main Funko Pop line is by far the most popular. Funko is a company that has actually been around since 1998 but didn't grow immensely in popularity until maybe a half-decade ago, with 2005 arguably being an important point in its history when the company was sold to an investment company (ACON). AFter this Funko started to widely expand its scope to a big range of marketing opportunities. Signing deals with everyone from Disney, to video-game companies, comic-book publishers, and basically anything you can make a fun little figurine out of. There will at times be Funko Pops exclusive to certain stores, conventions, or just generally limited. Some Funkos are mass-produced but eventually are no longer made and known as, "Vaulted." Another interesting concept is that sometimes a regular Funko will have a rarer version with a slight difference known as a, "Chase." For example it might feature a character holding a different object, with a different facial marking, etc. These, "Chase," Funkos usually are produced at a rate of about 1-in-6 and can be highly sought-after by collectors. Some people are very specific in the kind of Funko they collect, seeking out anything related to a property and nothing else. Other folk collect a wide-range of Funkos and might just have whatever they are into as a part of their collection. There are individuals who prefer to just look for/buy chase variants, and there really is no, "Wrong," or, "Right," way to collect Funko, you just seek-out and buy what you like! If you like to keep your Funkos in their box that's cool, but if you're an out-of-box kinda guy/gal that's great too. If you're only into, "Rick and Morty," and, "My Little Pony," you can just get those, it is about collecting what you love! 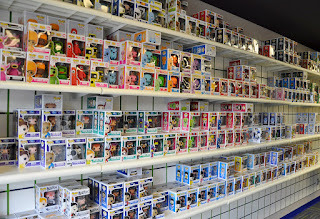 There are numerous clubs and online communities dedicated to Funko, with many people selling or trading their finds with others. There is often a strong hatred among these gatherings for, "Flippers," or people who go out and buy sought-after Funko Pops for the sole purpose of selling them at a profit. Everyone's definition of a, "Flipper," can vary though and I've met some people who camp-out in front of a store eager to buy the latest rare Funko and have found them to be perfectly nice folk, so I hold no ill-will towards anyone who buys a Funko in order to sell it for a small bit of extra cash--my opinion seems to be in a bit of a minority however. Speaking of buying Funko Pops however, where can you get the darn things? How Do I Buy a Funko Pop? Because they have become so popular you now can actually arguably find Funko Pops more places than you can't! 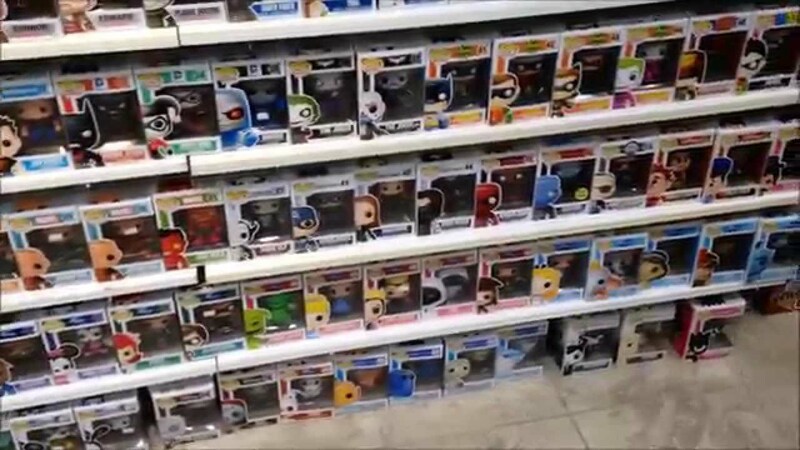 Toys R Us, Gamestop, Hot Topic, Walgreens, Target, Walmart, even some 7-11 convenience stores carry Funko Pops and many of them will have ones exclusive to their store-brand, which can be a headache for collectors. After all, if you're excited for the upcoming, "Black Panther," movie you're gonna be a tad annoyed at how you have to go to certain stores (or use eBay) in order to get all the figures that tie-in with the movie (and good luck finding the, "Chase," variants easily)! A lot of people enjoy the search for Funko Pops however and the thrill of finding a rare/vaulted Funko Pop or a, "Chase," Funko, "In the wild," AKA just sitting at at store. Basically, if you want to get into collecting Funko Pops you just need to go to a store and buy one you want. Should you desire not having to check countless places for a particular Funko you might want then the internet is a stellar resource. There are three ways I feel are, "The best," for buying that specific Funko you want. The Official Funko Shop: The official online store for Funko has a wide-selection and even some Funko Shop exclusives, but don't expect any amazing discounts. Also, I've found shipping to be a bit slow, but as this is the actual website of the company there are often things you'll only be able to find here. CNS Toys: This store is more focused on pre-orders I have found, but when it comes to pre-ordering Funkos they often have the best prices! They will sell guaranteed, "Chases," and are known for their stellar customer service which I personally can attest too--I messaged them on Facebook when it was Christmas Eve and they actually wrote me back within an hour! If you're going to pre-order a Funko I would recommend CNS Toys without a doubt. Also, I have a coupon-code for 5% off your first order, all you need to do is enter, "TNR5," at check-out and you're good to go! 11/20/18 Update: They declared bankruptcy and left a lot of customers with pre-orders angry with claims of being unable to refund money. Chrono Toys: No pre-ordering here, but Chrono Toys has a wide-range of stock and also will sell some discounted Funko Pops. I've heard stellar things about their customer service as well and have observed for some of their Funkos on sale they offer free shipping which is always appreciated. Should you desire to buy a Funko that is currently in-stock this is generally the site I would point you to. 7 Bucks a Pop: If you're after Funko Pops that are dramatically marked-down in price or you like to buy damaged boxes or even Funko without boxes, this is the place. 7 Bucks a Pop is also known for their extremely inexpensive Funko Pop Protectors which are bought in bundles and (before shipping) are only 49 cents each! If you like discounted Funkos or need some cheaper protectors this is the site for you! Freddy's Box: This site also does pre-orders and has a range of in-stock Funko Pops, but is more known for their mystery boxes. I'll discuss mystery boxes more in a future post so I don't have much to say about Freddy's Box right now but will explore their mystery offerings more in the future. Fugitive Toys: This store offers pre-orders as well as in-stock Funko and I've heard good things, but honestly I've found their pre-order prices to be higher than other websites and I find their site a little difficult to navigate and ugly. They still are a quality store however and a great option if they have something in-stock nobody else does. Pop in a Box: Another store with pre-orders as well as in-stock options, but this one actually won't let you specifically buy a, "Chase," instead having you pay their standard price for a regular Funko and letting you know there is a 1-in-6 chance you might get a, "Chase." They also offer the option of buying a monthly mystery Funko, which again is a subject I'll go more in-depth about in a future post. If you use my referral code of DAVID-R1PF you can get 20% off your first purchase, if you so choose. If you've got a smart-phone then you've got a way to easily check your local area for Funko Pops. I've heard many stories of folk finding great Funko Pops through searching apps like LetGo and OfferUp for other local collectors selling stuff. Also, many people love Facebook's Marketplace when it comes to buying as well as trading. Plus, I have sung the praises of Mercari, which has a big Funko community and gives new users plenty of coupons (use my referral code ENMPXA when you sign-up for an easy $10 off a purchase of $20 or more). Seriously though, as long as you've got a smart-phone in your hand you can basically look for Funko Pops in a variety of apps at anytime. If all else fails, go to eBay. As long as you're willing to shell-out some serious cash you can usually find even the rarest and most expensive Funko Pops as well as cheap common ones. Just always check the Feedback of sellers because the last thing you want is someone to pack your Funko poorly and it arrives in a busted-up box! This was a big post where a lot was covered! I hope if you didn't know much about Funko Pops you found this helpful and if you did already know a lot about Funko I still told you something new. I look forward to doing more occasional, "Funko Friday," posts as time goes on.